ALT 118 system is designed to create light partitions for locker and shower rooms and WC facilities in offices, shopping malls, educational and other public institutions. Partitions consist of aluminum frame that allows to use infill units of 16 mm thick. Wood laminated plastic can be used as an infill unit. 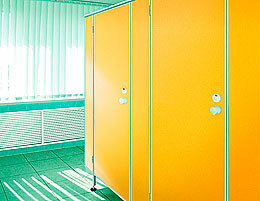 The system consists of 5 profiles for manufacturing of modular cubicles with or without swinging doors. The doors are made of the same infill material. Main system ideas are functionality and modern design. ALT 118 profile system allows to save place. Moreover, system’s main advantages are reliability, economical efficiency and simplicity of installation.